Are you doing a first look? Why or why not? 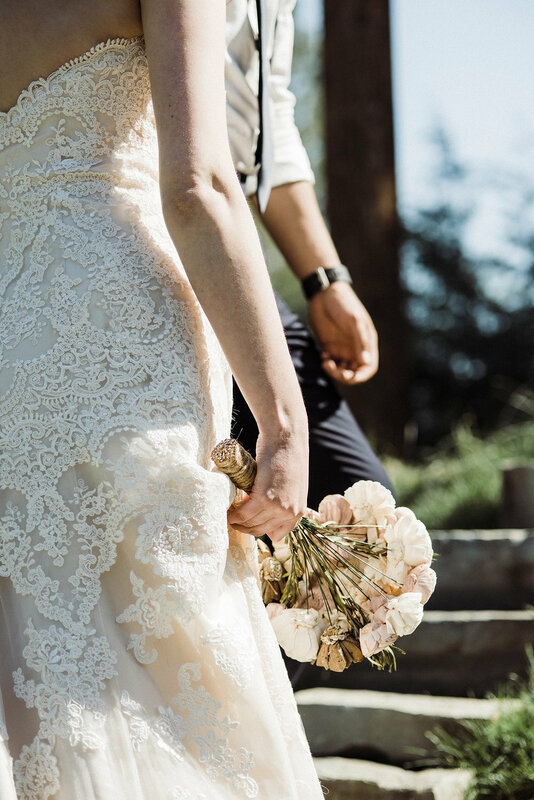 For most couples, there are two primary reasons why they choose not to do it: first, tradition; and second, the emotional reaction of seeing each other for the first time as the bride makes her way down the aisle. As for the emotional reaction to seeing each other for the first time as you walk down the aisle, I totally get it. It should come as no surprise that I love a good, raw emotional reaction. And sometimes it happens and its wonderful! And sometimes, the reaction is internal and not much happens externally. Some people (like me!) are naturally more reserved in front of a crowd and they might not have that monumental external reaction for a dozen reasons that have nothing to do with how they actually feel about seeing their soon-to-be spouse for the first time. Bottom line: there's no way to predict how you and your partner will react, so if you're choosing not to do a first look because you want a certain photo of your honey shedding a tear or falling to his knees when he sees you, there's a chance it won't happen, regardless of whether you've already seen each other. First, if reaction is what you're going for, this is a much safer environment to get that reaction. Just the two of you, away from the crowd, away from phones and cameras (except for mine and I'll try to stay out of your way). Without the pressure of a crowd or a ceremony timeline, you have a few minutes to truly enjoy that first glimpse of each other. You'll likely be running high on emotions and the freedom to be able to touch each other, to hug, to wipe each other's tears, and to tell each other what you're thinking is invaluable. Relatedly, by setting aside 15-20 minutes before the ceremony for a first look, you have a chance to just enjoy a moment of quiet together before the day sweeps you away. For my fellow introverts, this moment of peace with your person can ground you and recharge your battery so that you can be ready to entertain! Finally, as a matter of practicality, by doing a first look, you've made it possible to do all the group photos before the ceremony. This means everyone gets to head right to cocktail hour/the reception right after the ceremony! It also means you're not chasing people down for group photos when they're ready to party. It can be a big time-saver! Also, while I'll still pull you away for a few minutes at sunset for a couple more bride + groom portraits in that beautiful evening light, you're essentially free from photo obligations before the ceremony even starts! Ultimately, whether or not you decide to do a first look, your day will be beautiful. As always, feel free to throw my two cents right out the window and do exactly what you want to do! I've thought long and hard about what I want to say about this intimate wedding on Flathead Lake and I still don't have it down. So I'll just go for it. I met Jed and Taryn through Taryn's older sister Stacey last year. Stacey and I had met in Stats class during undergrad and bonded over a tough subject and a very pregnant, very hard to understand professor. We became fast friends, but as is often the case, life happened and we drifted apart after college. She stayed in Washington and I came back to Montana. Thank God for social media though. We were able to keep up with each other from afar and when her little sister, who was in college at Montana State University, got engaged, Stacey connected Taryn and me. When I met with Taryn and Jed initially, I learned they were high school sweethearts who had made it through a move and college together. They were sweet and down to earth and I was so excited to be working with them. 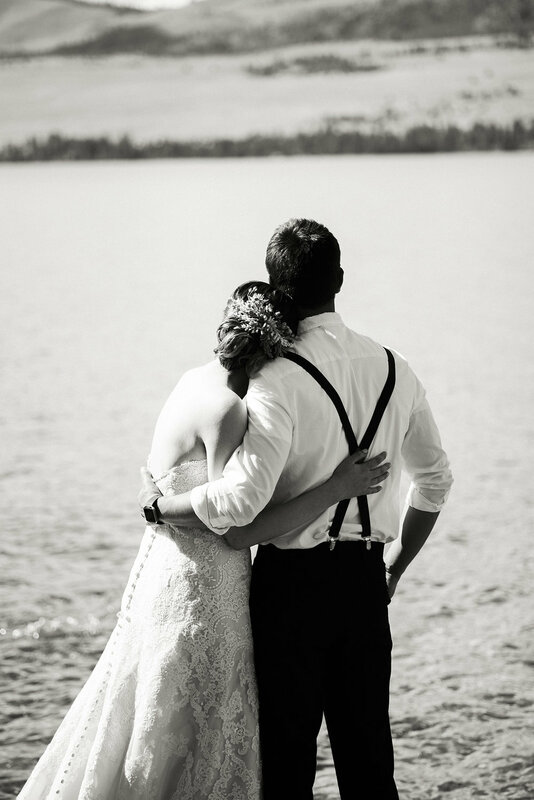 In the beginning, they were planning a bigger, more traditional wedding; however, they ended up changing courses mid-stream to go with a totally stripped down intimate ceremony at Jed's family's cabin on Flathead Lake. With something like 20 of their closest family members. Now guys, I love details and fanfare as much as the next girl, but if you take anything from this post, let it be this: these intimate ceremonies and elopements are where my heart is. I think this stems from spending the first year of my legal career divorcing people: I realized quickly that all the money and show in the world means nothing without heart and commitment as the foundation for the marriage. I've seen how hard life can get - how much kids, financial stress, and long hours at work can impact a marriage. With that in mind, I've fallen head over heels for these ceremonies that are simply about two people's commitment to each other. Nothing more. Jed and Taryn have been such a beautiful example of that commitment: what I have seen over my time with the two of them is that they are truly each other's best friend. Their wedding was an extension of that. I saw how important their families are to them, but just as importantly, that their day was simply about their desire to commit their lives to one another. These two chose a simple dock and the backdrop of the lake for their ceremony location. No frills, just the simple, striking beauty of Flathead Lake. They wrote their own vows and I'd be lying if I tried to tell you I didn't shed a tear during Jed's TWO PAGE POEM he wrote for his vows. Guys. Is this even real life? It is real life and it was perfect. After their simple, heartfelt ceremony and a few family photos, Taryn, Jed, and I set off on a mini adventure that included tree houses, log piles, and rocky lake shores. Fortunately, Taryn was well-equipped: she wore robbin's egg-colored Tom's! These two were so good-natured about exploring the property to find some great spots for photos and despite the harsh summer afternoon light, I love love LOVE these photos because of the two they reflect. Jed and Taryn, it was truly an honor to be there for your day. And Stacey, it was so good to reconnect with you, my friend, and I'll forever be thankful that you connected me with your sweet little sister! 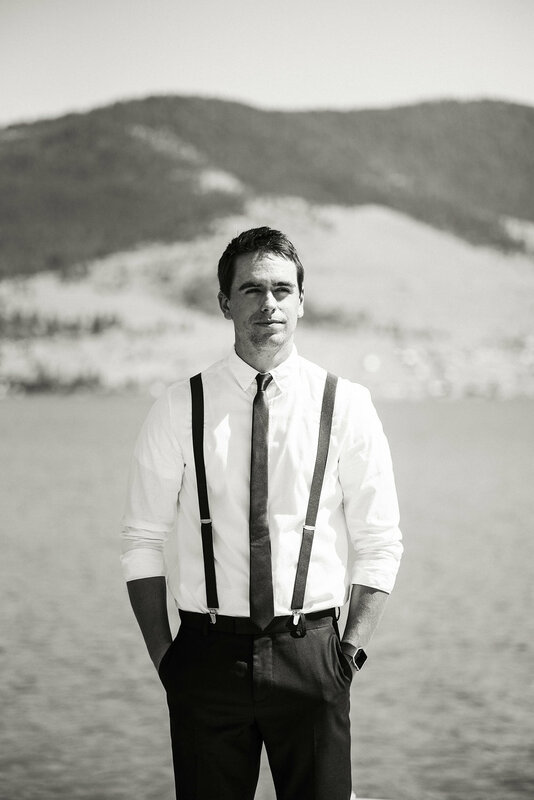 Scroll through for some highlights from this adventurous, intimate wedding.